This post and the following one focus on citing common language tools. Although one may reference such works like any other volume, SBL Press prefers a different approach that favors economy and specificity. For the sake of economy we recommend citing many of these reference works by abbreviation, not by full bibliographical listing. Our preference for specificity leads us to favor citation by section number rather than page. In most cases, a section citation helps readers to locate the paragraph being referenced more quickly and accurately than a page number. 3. Works cited by abbreviation are referenced the same in each subsequent citation; there is no shortened form. Language tools cited in full (see, e.g., Davidson below) follow the usual short-title reference style. 4. All works cited by abbreviation should not be included in a bibliography, only in an abbreviation list. 5. When they are frequently cited, works without an SBLHS abbreviation (e.g., Lambdin, Williams) may also be referenced by abbreviation. In such cases these works are listed only in an abbreviation list, not in the bibliography. The examples below apply the principles above to the most commonly cited Hebrew language tools. 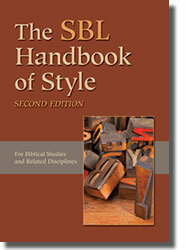 Readers with questions about works not covered are encouraged to email us at sblhs2@sbl-site.org. BHRG: This work can be cited by the abbreviation used here, provided that it is included in an abbreviation list. This reference grammar is divided into numbered sections, some of which are rather long. To help readers to locate the exact referent, supplement the section designation as needed (example 2). BL: Bauer and Leander’s Historische Grammatik der hebräischen Sprache is typically cited by section. To cite a specific part of a section, include the marginal letter, adding the prime symbol (not an apostrophe) when BL has it. Davidson: Unless one is referring often to Davidson’s Hebrew Syntax, the regular rules of citation in a footnotes apply. As a rule, cite this work by section, not by page. When necessary, use the lowercase letter at the beginnings of a paragraph to identify a specific part of a section. 36. A. B. Davidson, Hebrew Syntax, 3rd ed. (Edinburgh: T&T Clark, 1901), §39c. GKB: Not to be confused with GKC below, this German-language work is technically the twenty-ninth edition of Gesenius’s Hebräische Grammatik. Although the grammar was originally published in three volumes, it is cited only by section number. GKC: The abbreviation stands for the names of author Wilhelm Gesenius, editor Emil Kautzsch, and translator Arthur E. Cowley. This second English edition is based on the twenty-eighth edition of Gesenius’s Hebräische Grammatik. Although many sections have internal labels, citations should always list the section by number and marginal letter (or letters, if citing multiple sections, as below). IBHS: Cite Waltke and O’Connor’s work by numerical label and, if needed, the marginal lowercase letter labeling the subsection. To identify one of their specific examples, list it as shown in example 2. 25. IBHS §30.5.2b, example 3. Joüon: Like other grammars, this two-volume work is cited by section and lowercase letter labeling the subsection. It is preferable to cite a 1993 or later printing (technically not a second edition, although sometimes identified as such), which is a corrected reprint of the 1991 edition. Lambdin: Scholars may on occasion have reason to reference this teaching grammar. To do so, identify in a note the complete work by author, title, publication information, and page number (example 1) or, preferably, section number (example 2). 5. Thomas O. Lambdin, Introduction to Biblical Hebrew (New York: Scribner’s Sons, 1971), 119. 49. Thomas O. Lambdin, Introduction to Biblical Hebrew (New York: Scribner’s Sons, 1971), §107c. Williams: This work is generally referenced like any other book, with full publication information provided in a footnote. However, one should identify the paragraph in view by its marginal number, not by page. 6. Ronald J. Williams, Hebrew Syntax: An Outline, 2nd ed. (Toronto: University of Toronto Press, 1976), §446. Yeivin: Yeivin’s Introduction to the Tiberian Masorah is generally cited in full in a footnote. The primary identifier of a given section is the number assigned to it. If a section extends across multiple pages (e.g., §132 = pages 81–120), one may point to a specific location by identifying the page as indicated in the example. 31. Israel Yeivin, Introduction to the Tiberian Masorah, trans. and ed. E. J. Revell, MasS 5 (Missoula, MT: Scholars Press, 1980), §132 (111). BHRG Merwe, Christo H. J. van der, Jackie A. Naudé, and Jan H. Kroeze. A Biblical Hebrew Reference Grammar. Biblical Languages: Hebrew 3. Sheffield: Sheffield Academic, 1999. BL Bauer, Hans, and Pontus Leander. Historische Grammatik der hebräischen Sprache des Alten Testamentes. Halle: Niemeyer, 1922. Repr., Hildesheim: Olms, 1991. * Although recently reprinted, BL remains in the public domain and is available here. Davidson Davidson, A. B. Hebrew Syntax. 3rd ed. Edinburgh: T&T Clark, 1901. * This public-domain work is available here. GKB Gesenius, Wilhelm. Hebräische Grammatik. Edited by Emil Kautzsch and Gotthelf Bergsträsser. 2 parts in 3 vols. Leipzig: Vogel, 1918–1929. * Reprinted by several publishers. Part 1 is available online here. GKC Gesenius, Wilhelm. Gesenius’ Hebrew Grammar. Edited by Emil Kautzsch. Translated by Arthur E. Cowley. 2nd ed. Oxford: Clarendon, 1910. * GKC is in the public domain and available here. IBHS Waltke, Bruce K., and Michael O’Connor. An Introduction to Biblical Hebrew Syntax. Winona Lake, IN: Eisenbrauns, 1990. Joüon Joüon, Paul. A Grammar of Biblical Hebrew. Translated and revised by T. Muraoka. 2 vols. Rome: Pontifical Biblical Institute, 1991. Lambdin Lambdin, Thomas O. Introduction to Biblical Hebrew. New York: Scribner’s Sons, 1971. Williams Williams, Ronald J. Hebrew Syntax: An Outline. 2nd ed. Toronto: University of Toronto Press, 1976. Yeivin Yeivin, Israel. Introduction to the Tiberian Masorah. Translated and edited by E. J. Revell. MasS 5. Missoula, MT: Scholars Press, 1980.